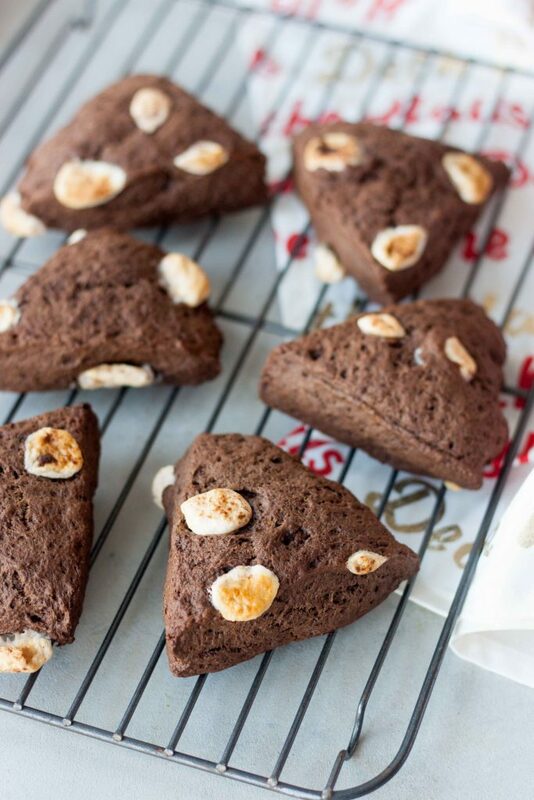 It’s a hot cocoa kind of day, Marshmallow Hot Cocoa Scones with a hot chocolate please! When temps get cold here there is nothing more comforting then classic hot cocoa. I also think it’s a requirement that one must be enjoyed every time it snows. Ok maybe not officially but every time it snows I ask the girls if they want hot chocolate and I always make it after a day of playing in the snow. Maybe it’s the childhood memories of hot cocoa that have me crave it. Playing in the snow as a kid and snuggling up with a mug of it when I got back inside to warm up. As I get older there is nothing more calming then watching the snow fall snuggled up with hot cocoa. I’ll be honest there are many days the girls don’t want it and one often wants white hot chocolate and even dairy free my oldest doesn’t like to have a lot of it, or I should say her tummy doesn’t if it’s heavy or too sweet. 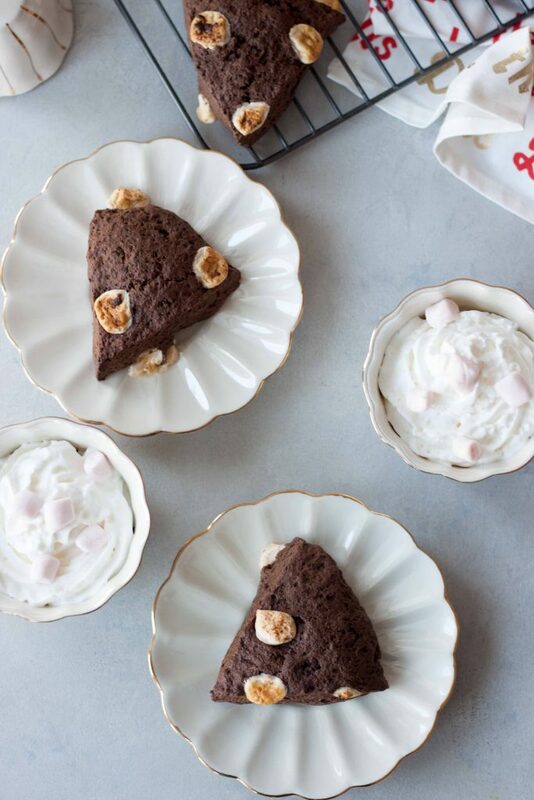 Sometimes you just need a small little mug, with marshmallows of course or whipped cream. Which brings up another debate of plain, with marshmallows, or with whip? I think it depends on the mood. 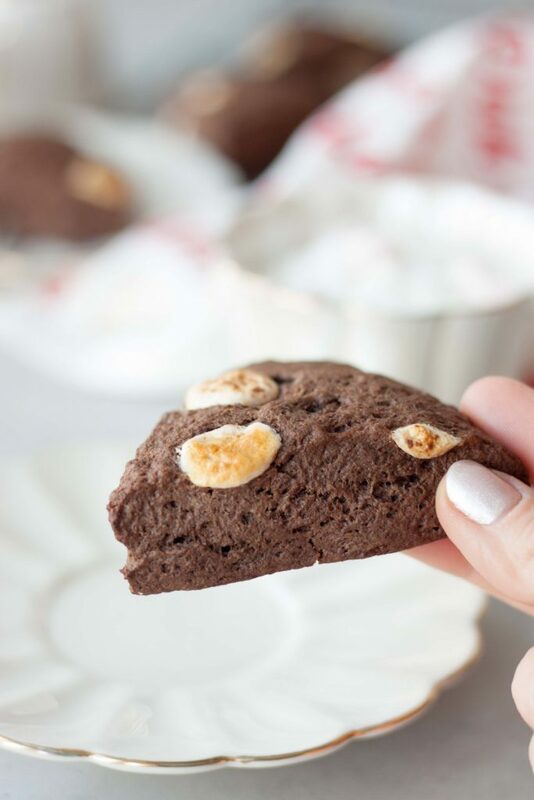 One thing my girls do love… scones and these Marshmallow Hot Cocoa Scones are a favorite! If you follow me on social media you may have noticed the return of our Scone Sunday family tradition. Are you a scone person? Do you have a favorite, dropped style or triangle, sweet or savory? I’ve actually never made a savory scone but I’m sure I’ll give it and try them soon enough. 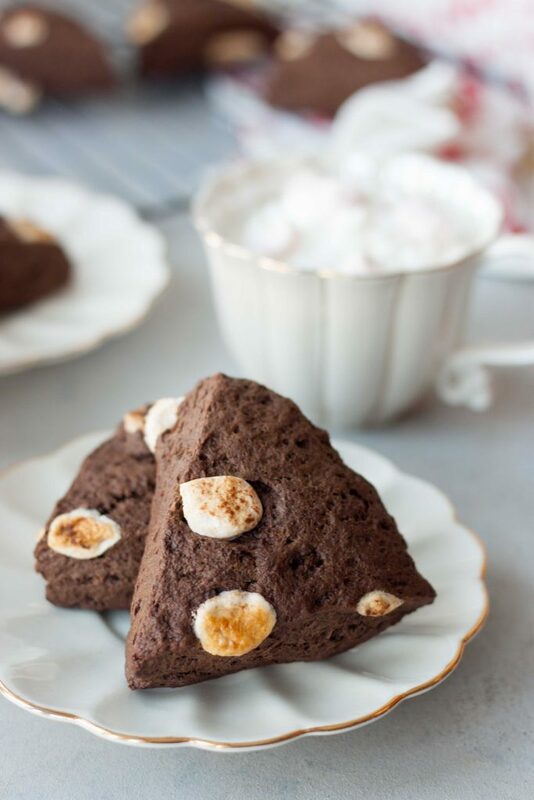 A couple weeks ago there was a debate on these scones and I made them with marshmallows baked inside and a marshmallow fluff glaze or frosting and the family and followers voted and the winner was Marshmallow Hot Cocoa Scones with the marshmallows baked in and all toasty! Can’t lie those were my favorite too! Actually it was the mocha version with peppermint marshmallows! Yes just one of the variations you’ll find in the recipe below, it’s like Starbucks only this mama isn’t making everybody a custom scone to order. Sorry! Here are the batches we made…. Then of course the ones with the marshmallow fluff glaze that I might share in the future (or if you voted for that version and you want it just comment below and I’ll send it to you or post it below) and there might be just one more variation coming this Sunday! I’ve got this crazy combo in my head and can’t decide if we’ll go simple or crazy. I think it will depend on when we get our Christmas tree this weekend if we need a little extra festive fuel! So which one would you order, umm I mean make yourself or your family? The recipe for these is vegan but adapted and variations of basic scones I’ve made for years (thought gluten free, vegan, dairy free, and no restrictions). If you aren’t dairy free or vegan you can use butter and heavy cream. For gluten free I use all purpose 1:1 baking flour and have made them in the past with my old favorite gluten free flour staple Cup 4 Cup (the blue bag, but it does contain milk powder but hasn’t caused us issues in the past). I will continue to adjust the recipe to meet my families needs and wanted to share so you can do the same. I don’t to jinx myself for saying this because I dislike cold and driving in snow but I’m dreaming of a little snow this weekend because picking out a tree in the drab brown and blah weather isn’t very festive. Even worse if there is now no snow and it’s freezing cold. Then I want to snuggle up with a scone while watching the girls decorate their tree. Usually we have cookies and the girls have tomorrow off so hopefully we can fit in making them otherwise it will be scones as the family already said we can’t miss this weekend! Just can’t but we were tired, stuffed, and not feeling it last Sunday so did Smoothie Bowl Sunday instead. Since we are now able to fit in getting a tree with S’s birthday being reschedule we are still fitting it in between soccer games and a dance recital, is that what they’re called? Not a dance mom and still trying to figure this whole thing out. A decided to take fall off for soccer and isn’t sure she will go back in the spring, she didn’t tryout so if she does want to go back she may need to wait until next fall, and wanted to give dance a try. She’s only trying one kind, a kick dance, since she’s still going strong with her gymnastics. So it might be scones and no cookies and I’m ok with that. Cookies will get made before Christmas because sugar cookies are tradition and one of my favorite things about the holidays, not necessarily eating them but spending hours decorating them. Yes I might be crazy but find it fun and calming. Hope you all have a great weekend and if you do many scones share them with me on social media, I’d love to see them! 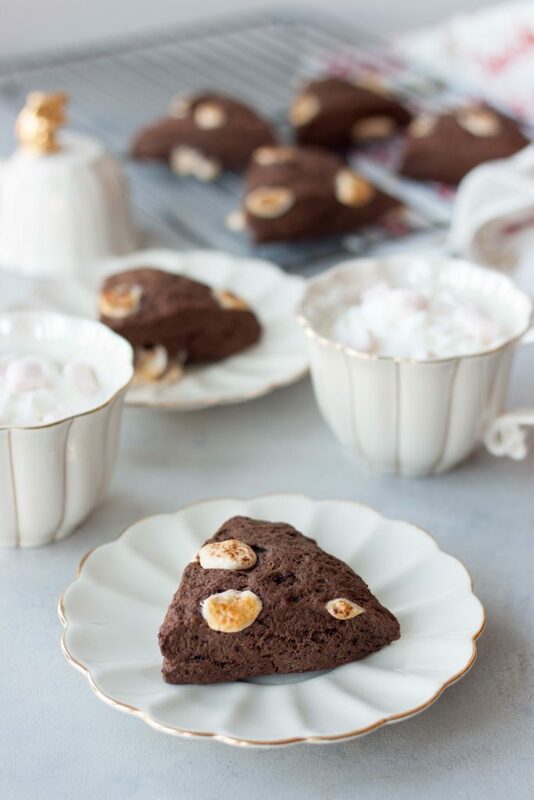 Marshmallow Hot Cocoa Scones are cozy and comforting like classic hot chocolate. Perfect for pairing with a cup of coffee or hot chocolate these scones are vegan and gluten free friendly. Mocha and peppermint hot cocoa and peppermint mocha options you and your family are sure to enjoy! In a medium bowl, whisk together flour, cacao/cocoa, sugar, baking powder, baking soda, and salt. Using a pastry blender or Kitchen-Aid cut the butter/coconut oil into the flour mixture until well incorporated and no chunks of butter/coconut oil remain. Add vanilla to milk and espresso powder if using to dissolve. Add in milk mixture to flour mixture until just incorporated. Add marshmallows until just distributed but don't over mix. Divide mixture into two balls and place one in the upper left half of the parchment paper, the other in the opposite lower right corner. Place another sheet of parchment paper on top and flatten each ball into a 6-7" circle. Place baking sheet in the freezer for 30 minutes. Remove dough from the freezer. Cut each disk into 4-6 wedges and arrange on non stick baking/cookie sheet or line a baking sheet with a silpat mat or parchment paper. Bake for approximately 12-14 minutes, until scones are light golden at the edges. Let cool 5 minutes before moving to a wire rack. *Measure Coconut Oil and Freeze, chop or grate into mixture . **For mocha add 1-2 teaspoons espresso powder. For peppermint add in a couple drops, careful a little goes a lot way, peppermint oil or extract. If making ahead pull them from the freezer after 30 minutes to cut. Arrange cut scones on silpat or parchment paper lined baking sheet covered with plastic wrap. Store in the freezer overnight and remove them from the freezer to thaw a little while preheating the oven. I vote for the marshmallow baked in too! Great choice! They’re so good and I love the toasted marshmallow taste and texture! These sound amazing! I love your feature in your recipe that you can change the amount and it adjusts! Love that! They’re so good! Thank you, it came with it and not sure I like the layout but I’m sticking with it for awhile. The family loves scones and they’re so happy the tradition is back! These look so fun and delicious! Perfect for breakfast or as an afternoon snack! Oh yes they’d be great with some afternoon peppermint tea!